This unit covers how to set up Fastcall’s listen in feature. This is an additional feature which must be enabled by Fastcall – it is not available by default. Listen in requires you to have enabled three way conference calling. See the separate training unit in the Advanced Fastcall Module regarding this. If you enable listen in, it will force call transfers to use ‘warm’ rather than ‘cold’ transfers. You can control listen in by going to Fastcall Settings > Admin Settings > Call Handling > Training Tools > Listen In. From here you can turn listen in on or off for outbound and inbound calls independently. 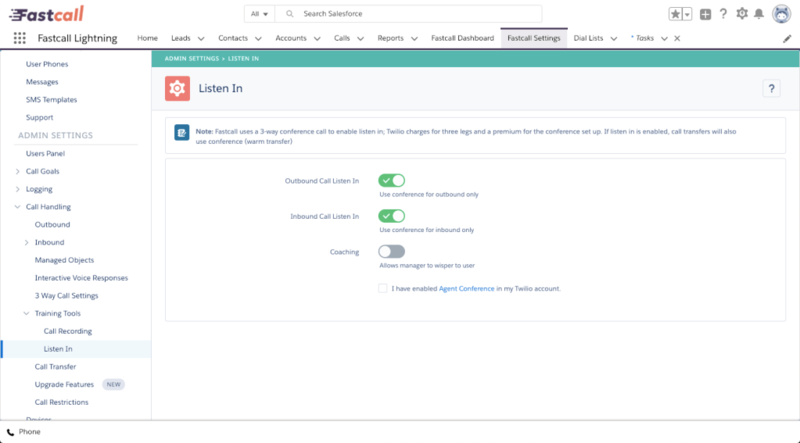 You can also enable ‘coaching’, which allows the listening in user to speak to one side of the conference call only. The ‘Agent Conference’ setting must be enabled in your Twilio account to use this.